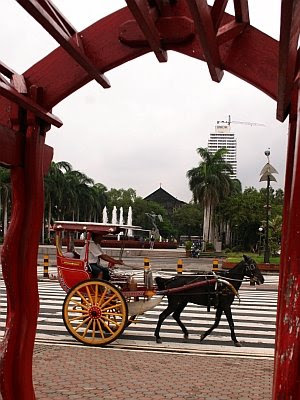 Popular history is taught to Filipinos that the City of Manila was "founded" on June 24, 1571 by Miguel Lopez de Legazpi after defeating Rajah Soliman's forces and proclaimed Manila the capital of the archipelago. The city was later granted by the King of Spain a coat of arms and the grandiose title: "The Noble and Ever Loyal City ". Was Manila really founded on June 24, 1571? History will answer this question that what was founded 438 years ago was the walled city of Intramuros by Legazpi over the ruins of Maynila. Manila was already a thriving community at the mouth of the Pasig river and Manila bay even before the coming of the Spaniards so why celebrate the "foundation" of Manila on June 24? What about the Nilad tree? Ambeth Ocampo asserts that there really is no nilad tree, rather a nila tree. Maynila was so named because of the presence of the nila tree in the area. Nilad tree is just a legend as well as Maynilad only for misinformed souls. It is also noteworthy that Manila's coat-of-arms under the Spaniards used a symbol of the merlion, a half-man, half-fish, icon on the seal symbolic of Manila's marine lion beginnings. The Merlion symbol use thus preceeds Singapore Merlion for about 400 years and yet the image is now synonymous with Singapore. 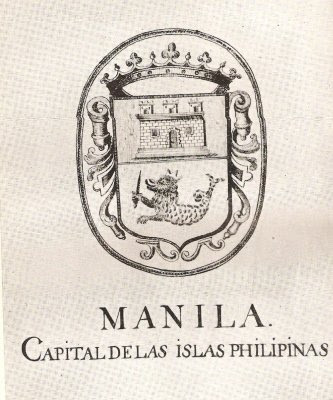 the Coat-of-Arms of Manila during Spanish times. The present seal of the City of Manila still feature the merlion symbol unknown to most people of Manila and Filipinos. Will Manila ever regain the recall of the merlion symbol it once owned or forever lurk in the shadow of the now more popular merlion of Singapore, now the popular icon of the Lion City conceived only in 1964? Today, Manila is now part of Metro Manila, a conglomeration of cities and a lone municipality. Rajah Soliman (Sulayman) is honored mostly for the park named in his honor in Manila's Malate district. Tutubi is not one with the people of Manila in celebration of Araw ng Maynila for he does not approve of the date of celebration. June 24 is a non-working holiday in Manila but not in the whole country. The day is marked with celebration and schedule of activities all over the historic city but Manila denizens (of which Tutubi was once one for ten years) should know that they're really celebrating a historical error. As Carmen Guerrero Nakpil puts it, June 24 should not be Araw ng Maynila but rather Araw ng Kastila! So when is the araw ng maynila supposed to be? 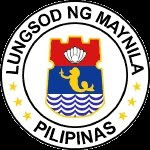 i've never really seen the manila coat of arms until now, thanks. aba..atin pala yung merlion symbol? Pati nga yung pearl of the orient kinakabit na din sa pangalan ng Singapore..tsk tsk. very informative, tutubi! thank you for sharing. acey, it's actually an old pic of baywalk, the framing i used is no longer there. we all get entangled with conflicting historical info. This is one informative post. From what I gathered, Araw ng Maynila is simply a commemoration of Manila when it was established as a 'city' (complete with a municipal government, system etc...the works), I know the sultanate of Maynilad existed before but not as a functioning city. In my walking tours, I say that June 24 is establishment of 'modern' (and colonial) Manila to give credence to her Islamic sultanate past. Something to that wording that is why I make a distinction and emphasis over ancient and colonial Manila, I specify that June 24 is 'founding' of MODERN (read: Colonial) Manila. Somehow, not knowing these facts you mentions gives a very 'colonialist' view of history, something (alas!) that we have been passing on to a whole generation of Filipinos for the last hundred or so years. Didnt do free tour this year as had something for that date. The merlion is also used as a "coat of arms' symbolizing the american and philippino soldiers who endured the Bataan Death March during WW11. 'The battling Bastards of Bataan" My grandfather was one of these brave men!